Most of our slim fitting tees are from the US so they tend to fit half a size up from Australian sizes. They are not baggy, however. Many of our brands print on American Apparel – and when they do this is explicitly stated on individual product pages. If you know what size you fit in American Apparel you can order these tees with absolute confidence they will fit! If you fit an Australian* small go with the small – unless you are super short – in which case you may find our tees a tad long. If you are of average height and weigh around 55-65kgs smalls are probably right for you. If you fit an Australian medium go with the medium. If you fit an Australian medium to large go with the medium. If you are of average height and weigh around 70-80kgs mediums are probably right for you. If you fit an Australian large go with the large. If you fit an Australian large to extra-large go with the large. If you are of average height and weigh around 85-95kgs larges are probably right for you. If you fit an Australian extra-large to extra-extra-large go with the extra-large. If you are of average height and weigh around 100-110kgs extra larges are probably right for you. Junk Food mens t-shirts are not as fitted as American Apparel – they run a little shorter and wider. Toddland tees are pre-washed and fit a little more snug than American Apparel. 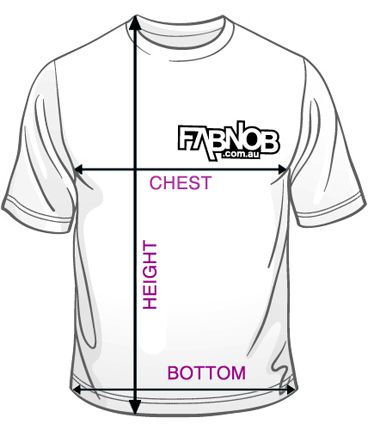 There is a fair bit of variability with the women’s sizing so below we have tried to provide as much information as possible for each style. For a fitted look Australian sizes 6-8 order S, sizes 10-12 order M, & size 14 order L.
There is a fair bit of sizing variability in Wildfox items. Please Contact Us with any specific sizing questions. Wildfox Crew T-shirts have a slight A-line: tight around the bust with a looser fit towards the hips. Super-stretchy fabric, however, so will fit most busts. For a relaxed fit Australian size 6 order XS, sizes 8-10 order S, sizes 10-12 order M, & size 14 order L.
For a relaxed fit Australian size 6 order XS, sizes 8-10 order S, sizes 10-12 order M, and size 14 order L.
Wildfox Baggy Boy Tanks are a little oversized. For a relaxed designer fit Australian sizes 6-8 order XS, sizes 10-12 order S, & size 14 order M.
Chest cms 41 43 46 ??? Wildfox Oversize V-Neck T-shirts are quite a bit oversized. For a relaxed designer fit Australian sizes 6-8 order XS, sizes 10-12 order S, & size 14 order M (or S if M not available). Chest cms 48 51 53 ??? Wildfox Slasher tees have a standard fit. As a guide Australian sizes 6-8 order S, sizes 10-12 order M, & size 14 order L.
For a relaxed fit Australian sizes 6-8 order S, size 10-12 order M, and size 14 order L.
For a relaxed fit Australian sizes 6-8 order XS, size 10-12 order S, and size 14 order M.
For a fitted look Australian size 6 order S, sizes 8-10 order M, & sizes 12-14 order L.
Junk Food womens t-shirts – especially size S – are quite small / fitted. Super-stretchy fabric, however, so will fit most busts. For a fitted look Australian size 6 order S, sizes 8-10 order M, & sizes 12-14 order L.
For a relaxed fit Australian sizes 6-8 order S, sizes 10-12 order M, & size 14 order L.
A reminder all unworn t-shirts can be returned within 30 days for an exchange or refund. Feel free to Contact Us with any size related questions.